Well, it’s a hot one. I’m not complaining, because I’d prefer heat to cold any day. We got a later start to the day because my dear son actually slept in until 9:15 — I know, WHAT? I don’t know. I’m not getting excited. 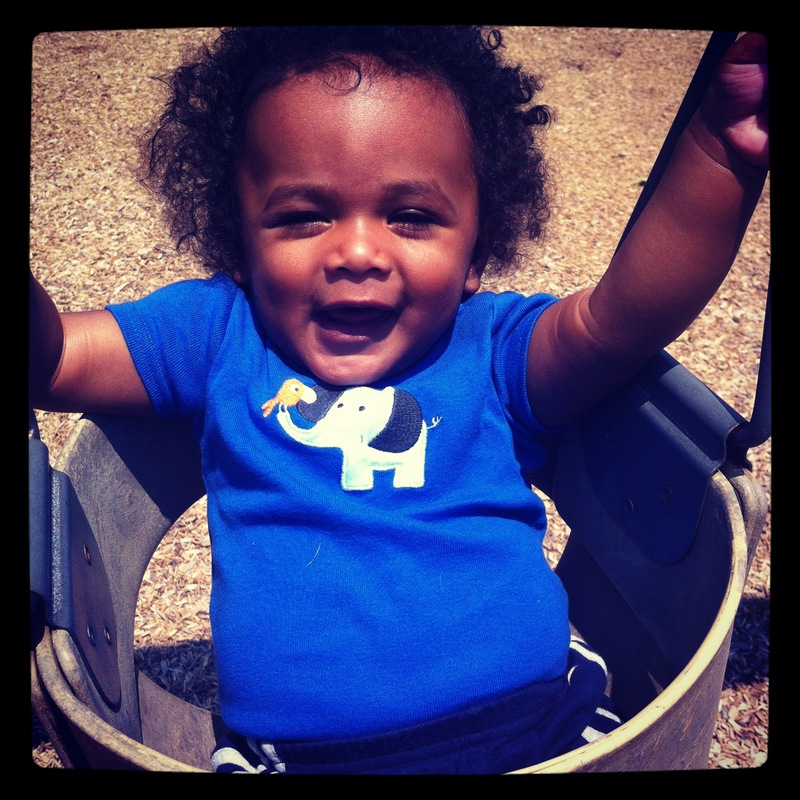 Today was Eli’s first time on swings. He LOVED it. He laughed the entire time and tried to mimic my “Wheeee!” I died of cuteness several times. And then I died of heat stroke. So we came home and made this. Put oranges, milk, and nuts in the blender and process until smooth. Add remaining ingredients and process until desired consistency. I love the combination of orange + cream. 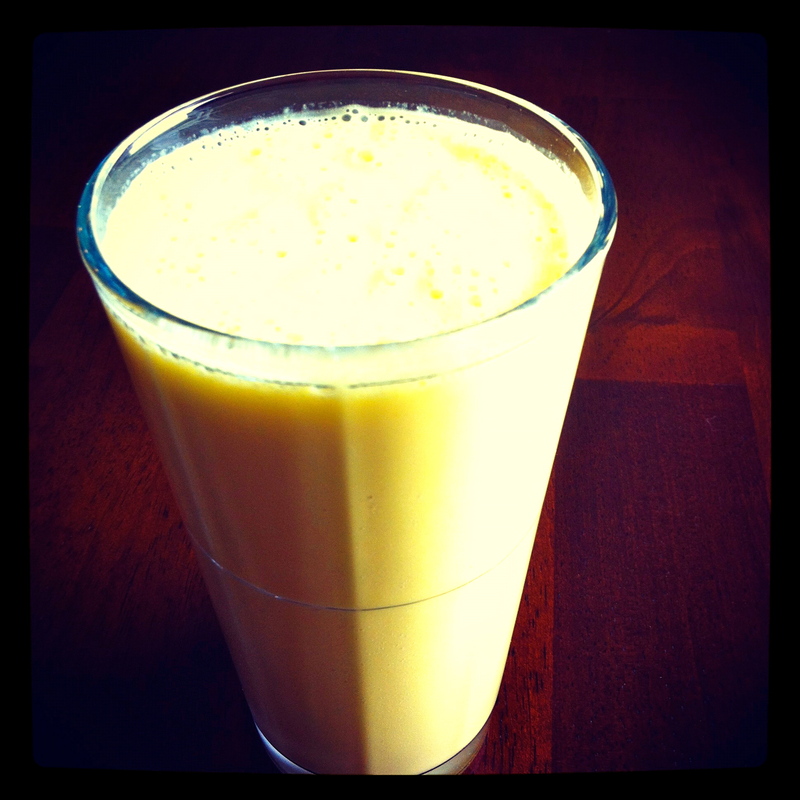 This is a very healthy alternative to say, a sugar-laden Orange Julius or a regular Creamsicle. Can you use orange juice instead of whole oranges? You can, and it will probably taste fine, but nutritionally, it won’t be that great. Fruit juice is pure sugar without the fiber to aid your body in digesting it, so it will just do a spike ‘n ditch on your system. By processing the whole oranges in the blender, you’re giving yourself the fiber in addition to the sweetness. If your oranges are super sweet, don’t even bother with the Stevia and instead add a few drops of vanilla extract. The cashews are kind of optional, but they lend a creamier texture to the drink. I would avoid almonds or almond butter because they will change the taste. I had to restrain myself from throwing in a handful of spinach. I think it would still be tasty, but not an Orange Creamsicle. Maybe next time! This was a perfect treat to cool off with. Eli enjoyed a little too. What’s your favorite “cool off” beverage? I have several pairs of pants in several different sizes. Some haven’t fit me in years, some have never fit me, and some have only recently been rendered useless. I kind of gauge whether I’m on the heavy side or not by which pants I can fit into. 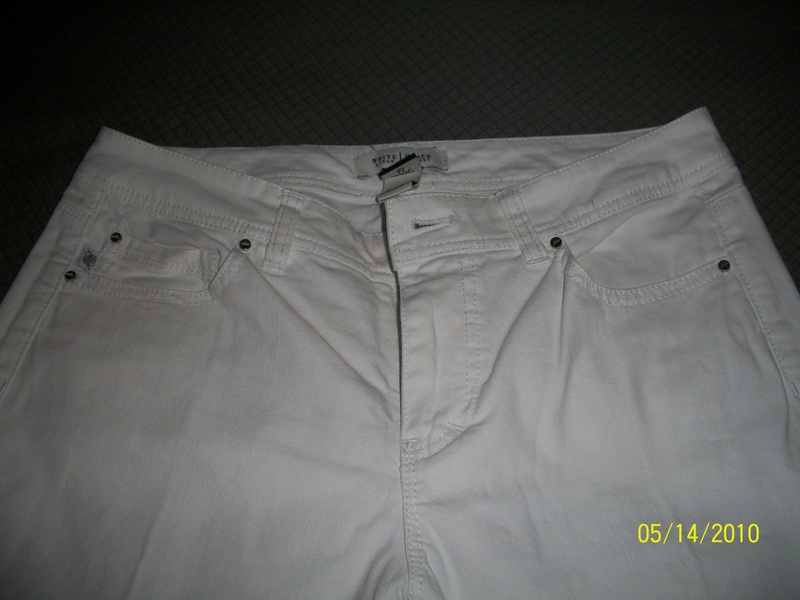 The above pants are extremely cute white jeans in a size 6 petite. When I bought them they were a bit snug (read: muffintop! )I figured these would be my first milestone pants, and hopefully after 1 month of the challenge, I’ll graduate into them! I would have taken a picture of myself IN them, but I just can’t do that you, lovely readers. I promise to take a picture once I actually get back into them, nicely. I started the challenge yesterday, as I said I would. My nasty hangover kept me horizontal until about 4pm, but I managed to crank out a good 45 minutes on the bike and sweated out some of those toxins. When I got home. 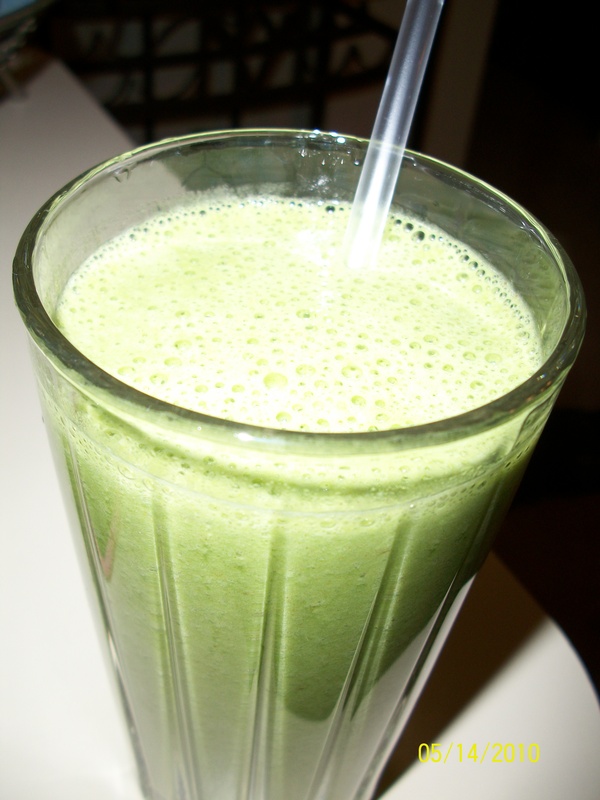 I decided I needed a super green drink to flood my system with goodness after the gross stuff I’d be eating all day. — A quiche, two cans of regular soda, chocolate covered graham crackers — yes, I’m awesome. Anyway, I basically put everything green I could find into this bad boy. It was actually kinda good! The lime was a refreshing twist and cut the green flavors nicely. I felt much better after my workout and the green drink. Today me and the Hubs are off to a slow and relaxing start. We’re going to compile our list of favorite houses (yay!) and then a bit later we’ll hit the gym — where I think I’ve got an upper body workout waiting for me.